Vacation rental house. Sleeps 9, 4 bedrooms, 2 bathrooms. Cats, Dogs allowed. Draped in its best seasonal color, this chalet is perfect for that Winter retreat to NH's White Mountains, and Cannon Mountain ski area which is just minutes away. Nestled in the quaint ski Village of Mittersill NH, Haus Hartnett awaits you! Great westerly views all but ensure enjoyable sunsets while relaxing on the deck at Haus Harnett come day's end. Call to make your plans today! A big wall of windows helps bring the outside in. The living space is spacious as well as comfortable. It's all here - views, fireplace, modern flat screen TV, a plush couch... the only thing missing is you! Looking from the living room toward the dining and kitchen areas of the main floor. Good spot to enjoy the fireplace too. This kitchen is well equipped with all the tools and accessories necessary for a full feast, and makes for quick, complete, and easy breakfast time meals too. Main floor full bathroom, located off of the master bedroom. The main floor master bedroom offers its guests a queen size bed with full attached bath. Ground floor family area. Lots of room for the kids to lounge around... and isn't that one of the best parts of getting a vacation rental? Call today! Here's a view of the folding wall in the back left corner of the photo, so if you must close the bunk room for privacy, it's easy. Bedroom #2, on the lower level, featuring a queen bed. Bedroom #3, also at ground level, offers guests a third queen size bed. 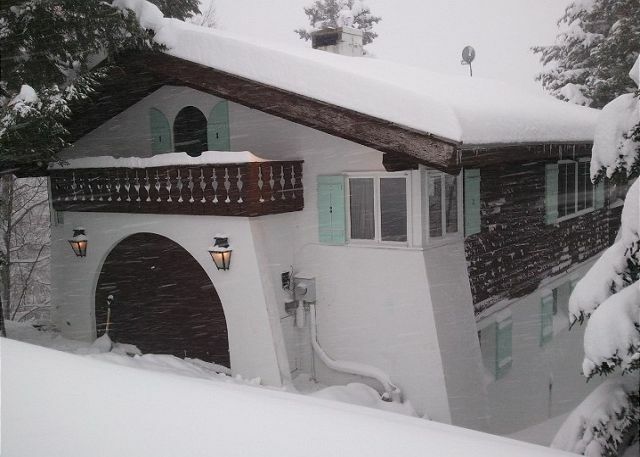 A genuine Mittersill Village Chalet, family crest and shutters included. Very similiar views as you'd find in Austria too! A Professionally Managed Franconia Notch Vacations Mittersill Village Chalet, Haus Hartnett is perfectly situated to really make the most of getting away from it all. Cannon Mountain will be under 5 minutes away, and for those hardy back-country type skiers, you'll enjoy skiing back to this spot at days end, conditions permitting of course. 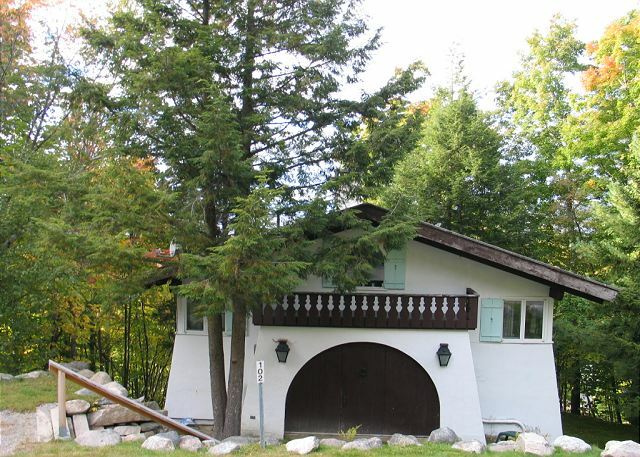 Offering two levels, four bedrooms and two baths, this chalet comfortably sleeps 8-10 and is accepting of pets, under proper conditions and understanding, so there truly is room for the entire family to enjoy Haus Harnett. The main floor offers grand views to the valley below from the living/dining areas with access to a deck, a fully equipped kitchen, and one queen bedroom with a full bath. Step downstairs and you will enjoy 3 more bedrooms, 1 full bath, and a family den that includes an entertainment area, plus a full size washer & dryer in its own separate room. 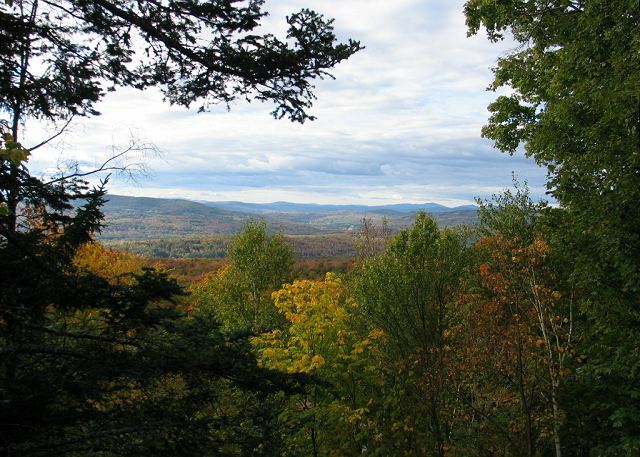 All this just steps away from Franconia Notch State Park and Cannon Mountain Ski Area, and within 30 minutes of Bretton Woods, Loon Mountain, and all the other 16 major White Mountain Attractions. Call to plan your stay today: 800-247-5536! Suzanne S K from Newburyport, MA does not recommend this vacation rental. The house was in a great location but The house needed some serious updates; the upstairs was cold and I could not adjust the electric heat because it was in a lock box. The basement living space ,on the other hand, had a heating system that never turned off so it was much to hot to enjoy. The house was generally was clean except for the ceilings in every room. The cobwebs were disgusting. I have been very satisfied using Franconia Notch Vacations in the past and will still use them but not sure I will stay in a Mittersill property again unless it is updated. One mans disappointment is another's delight... Thank you for sharing your experience accordingly. This really is a neat (not perfect) spot with much to enjoy, while here in lies proof that if you look to the good, it's all here to be had. We're still working to make it better no less. The place could have been cleaner. Cobwebs in corners and on beams. The 2nd floor bathroom sink flooded twice. We could not figure out what caused this. Thanks for the info... as the sink drain was found to need and has been cleared, and a Deep Spring Clean is forth coming, last week of March 2018.
a guest from Hingham, MA does not recommend this vacation rental. 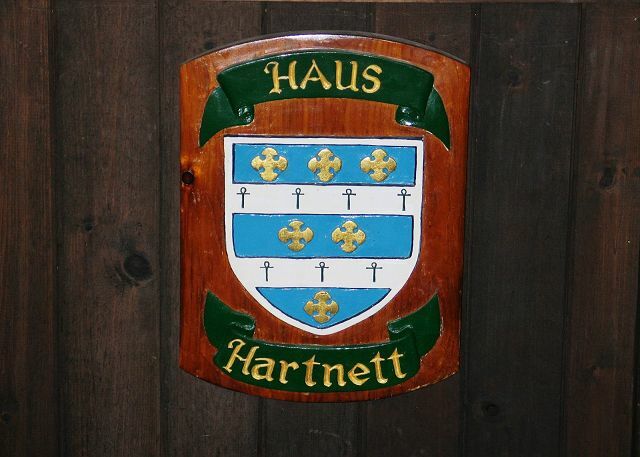 Haus Hartnett is what we could call rustic. It is well worn. I don't believe much has been updated since it was built in the sixties. We can roll with it and found it to be charming. Cort at the management company is the man and was super responsive to our needs. But we could have done without the mice. That should be addressed. The house is in Mittersil Village, so you are within walking distance of the Mittersil lift and t-bar. And within a 5 minute drive to the main (Peabody) base area. On the minus side, if you need to make a grocery or beer run, you would need to drive 20 mins to Lincoln. 3 bedrooms for 3 sets of parents. One large room with bunk beds for kids. Views are amazing. Fog filling the valley, sunset. The rooms/house/facilities are basic but adequate. Help from management is great - the coffee maker was missing a lid, Cort got us a new coffee maker within the day. I forgot a library DVD in the house - found and mailed within a couple of days. We have used a bunch of rental places - mostly around Lincoln - to ski at Cannon during the school vacation week. I would rank this place near the top - mostly for the proximity to the mountain. Very happy with our stay and the accommodations. Everything worked out well for our family. This place is great all around. It has tons of beds for people to sleep in, a big comfy couch upstairs, and beautiful views. It's also close enough to Cannon to walk. Like actually you can walk if you want to, we did. We had a very good stay at House Hartnett. The space easily fit two families (9 people all together). Kids loved the bunk beds and they layout of house is very appropriate for the group. Some of the furniture was a bit dated, but its a ski house after all. Nice property. Clean and comfortable. Modern kitchen. Bathrooms in good order with quick hot water and plenty of pressure. WiFi very fast and reliable, no issues streaming Netflix etc... Quiet with pretty views from the decks. Flawless check-in and check-out, the staff was great. Dining room chairs need repair/ replaced. Closets somewhat cluttered with gear that could be stored elsewhere, minor issue. Overall a very good choice for families ( downstairs bunkroom layout is ideal) or a group of young adults looking to get max time on the nearby mountains at Cannon/ Loon / Bretton Woods, all less than 30 mins away! We had a great time snowboarding/skiing at Cannon and Loon. Hopefully we can make it back to NH sometime in the future. This is our second winter renting Haus Hartnett for several weeks. It never disappoints. Great location minutes from the base of Cannon and walkable to bottom of Mittersill chair. Ample parking, all the kitchen tools you'd need to feed a big group, and of course, plenty of beds. It feels homey and has gorgeous views of the valley. Perfect for a family or group of friends. Would highly recommend - we will be returning! What a wonderful place to stay for skiing! We loved the location, but there were some problems with the general condition of the chalet. The lock on front door did not work properly and we were locked out and had to call the manager to let us in. The dining room chairs were uncomfortable and in poor shape, so we had to put pillows on them in order to sit on them. Also there was no tea kettle, so we had to go to bring one from another house. Indeed, sorry about the door lock having failed on you on Christmas Eve, though let's note that we had their chalet re-opened for ready access before they'd returned from dinner, within 30 minutes of their call. And thanks for the other constructive points made here, as they are sure to help the owner make the best decision(s) in making future upgrades. Thank you again for being our guest! Franconia Notch Vacations is a top notch organization. I will always rent through them whenever I am in the Franconia area. Service and the properties are both outstanding. The only reason we gave 4 stars instead of 5 for "property's general condition" is that the dining room chairs are beat. Other than that, all 9 of us (6 adults/2 teens/1 junior) give a double thumbs up for our vacation rental experience. We plan to return next year and hope to rent the same property. Glad you enjopyed your stay so much Mrs. B. We'll see if we can't work on those dining room chairs between now and then also... Thanks again & always!! Very clean, comfortable, wonderful place to stay! The rental was even better than expected. Perfect location and perfect size for our large group. This property is in the Mittersill village - a quaint swiss-style community 1 minute from skiing. The chalet was a great spot for our two families with teenagers to gather. Large living area and kitchen table that seated 8 comfortably. Great views also from the large living room windows. Downstairs bunk room/tv room was a nice alternative spaace for the teens to hang out. Also dog friendly which was a plus as we brought our pooches.